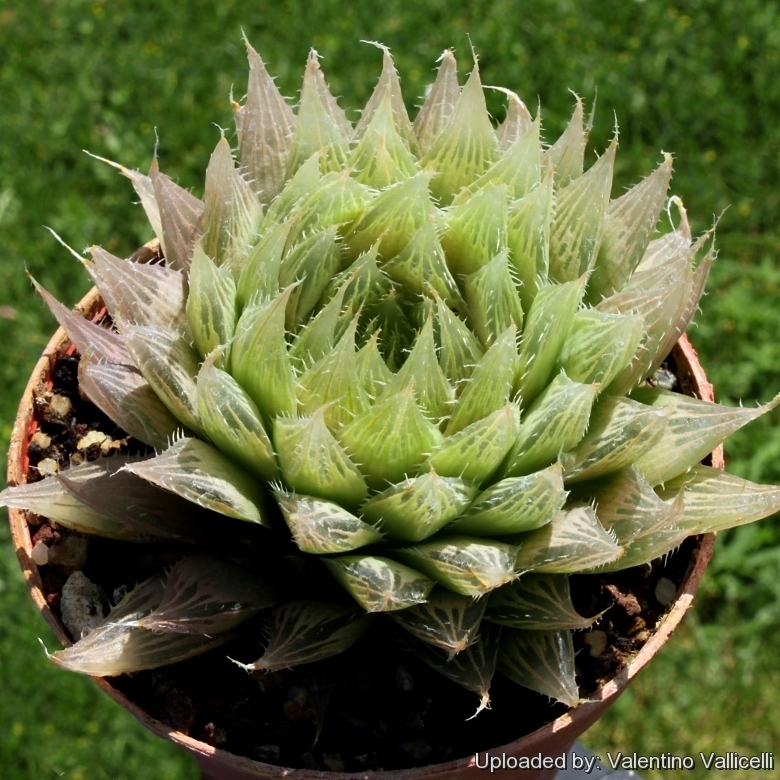 It is a free clumping stemless rosette succulent with translucent fenestrate leaves. Origin and Habitat: South Africa (Eastern Cape Province). Altitude: 800 - 1000 metres above sea level. 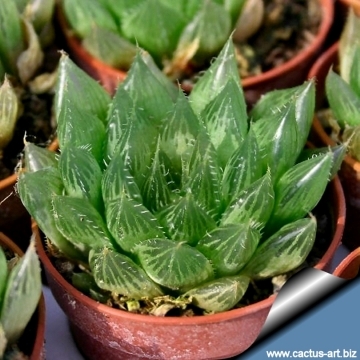 Description: Haworthia cooperi is a low growing densely clustered succulent which rosettes are usually withdrawn in the soil. 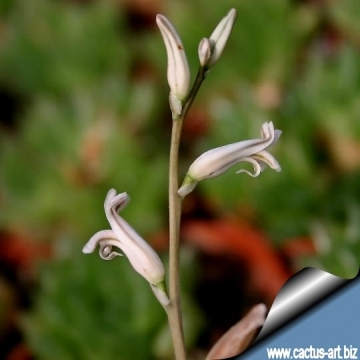 Its short stem is located several centimetres underground, and produces many cylindrical leaves that are just long enough to reach the soil surface, the transparent tips allowing light into the factory below. In transverse section the leaf is so transparent you can read through it. It is excellent for transmitting light to parts of the leaf that are underground. It was introduced into cultivation by Cooper in 1860. 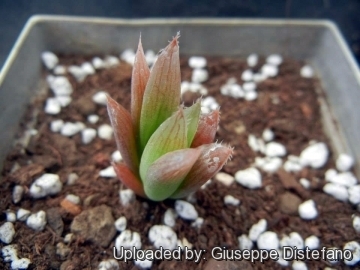 Remarks: H. cooperi is a variable species that is difficult to distinguish from other Haworthia species, particularly Haworthia cymbiformis and Haworthia decipiens. Rosettes: 35-90(-120) mm across each with 20 to 40 leaves . Leaves: Up to 20-25(-50) cm long, c. 6mm thick, turgid, multifarious, oblong-lanceolate, half buried in the ground except for the translucent tips, often round and ending abruptly or acuminate with a large pellucid terminal awn to 6 mm long, flat on the face, convex on the back and keeled upwards or with both surfaces convex, pale green, grey-green or bluish-green with dark longitudinal lines becoming reddish with too much sun or not enough water. Margins and keel with pellucid deltoid-cuspidate teeth 2-4 mm long or smooth. The tips of the leaves have transparent epidermis with marks radiating from the awned leaf-tip, and the mesophyll is also transparent because it has no intercellular spaces. Consequently, light enters through the window-like tip and then passes deep into the rest of the under-ground leaf, where cells with chloroplasts are located: photosynthesis actually occurs underground. Because most of each leaf is subterranean, they stay cooler in summer, they are less visible to animals, and the air in the soil is richer in carbon dioxide than is air above ground. Inflorescence: Peduncle simple, about a 30 cm long; raceme simple, 15 cm long consisting of 20 to 30 closely set flowers; pedicels very short; bracts deltoid, 3-6 mm long narrowly elongate, whitish. Flowers: Narrowly elongate, whitish. The flower's Structure, colour and fruits are typical of the genus. Perianth c.2 cm long; segments half as long as the tube. 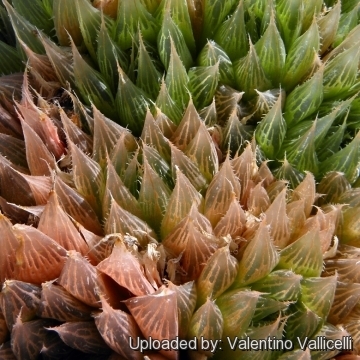 Notes: Haworthia has been plagued with an overprolification of names, recognising variation over similarity, and causing much confusion. 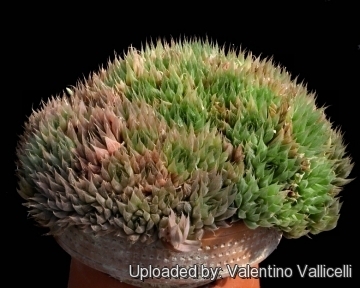 The genus needs to be revised using population-level molecular techniques in order for species concepts to be resolved. 16) Bayer, M.B and van Jaarsveld, E. 2001. 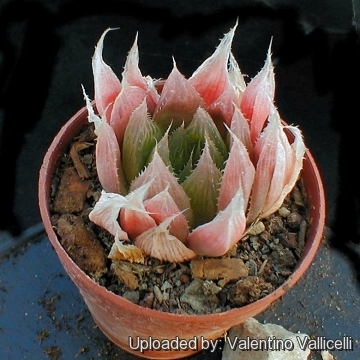 “Haworthia. 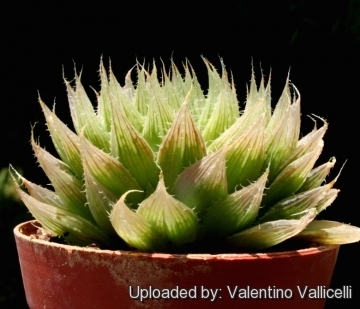 in Illustrated Handbook of Succulent Plants: Monocotyledons.” Springer, Berlin. 17) Bayer, M.B. 1999. 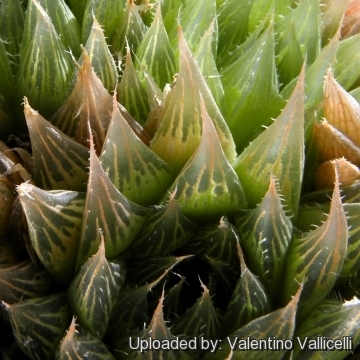 “Haworthia Revisited: A revision of the genus.” Umdaus Press, Hatfield. Cultivation and Propagation: Needs regular water (They enjoy a little water during winter period too) but do not overwater as they will most likely wind up with root rot, and do not water again until dry!